Legal Atlas regularly engages in project oriented work on a contract basis. Some of our projects are focused on developing content inside the Legal Atlas platform, creating publicly available knowledge resources. Others focus solely on legal assessments or training of legal professionals. ​Most projects take advantage of our legal intelligence platform in some way to support rapid comparative analyses, or legislative development based on legal best practices, or other law and development related exercises. Descriptions of existing and past projects can be found on separate pages found in the PROJECTS sub-menu. Below is a summary of some of them. Lead by Dr. Jacob Phelps at the Lancaster Environment Centre, Lancaster University, this project is examining how sanctions against IWT can better reflect the injuries to society (for example, on livelihoods, biodiversity, and culture). 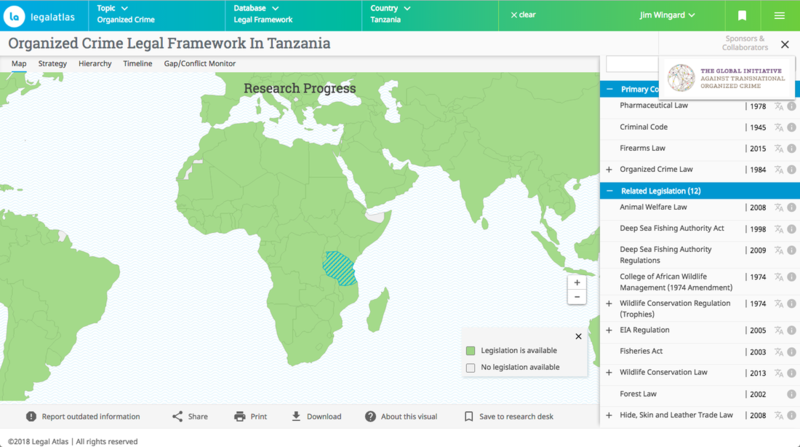 Legal Atlas will support the research through its legal intelligence platform enabling the rapid and comprehensive compilation and comparison of sanctions applicable to illegal wildlife trade, as well as the evidence based development of international “best practices” standards. A legal assessment, based on a systematic analysis of international and national legislation, in support of Arcus’ efforts towards the conservation and protection of great apes and gibbons. The analysis will not only help identify internal gaps and conflicts, and the level of compliance with existing international obligations, but will also help highlight existing opportunities to support enforcement and prosecution strategies, including novel approaches that may be available, for example, in trade related legislation. Preliminary results presented at CITES Animals Committee Meeting in Geneva on July 17th, 2018. Project to identify key legal content to support a targeted indexing exercise. Project was conducted by a joint team comprised of experts from Legal Atlas, ENACT, and GITOC. Legal Atlas was responsible for the rapid compilation, publication, and tagging of legislation covering organized crime (limited to five (5) specific types of organized crime) to support the assessment of the ‘political will’ countries have in addressing the issue as evidenced in part by their legal preparedness. The scope of the project was global resulting in a digital recored in excess of 1,000 related laws in 165 countries. Initially sponsored by the Asian Development Bank to support the Asian Judges Network for the Environment, this project compiled and assessed frameworks for wildlife trade legislation for later publication in the Legal Atlas platform. ​Since its initiation in 2013, successive research efforts have contributed to the compilation of 60+ national legal frameworks for IWT; a set of related international treaties; several legal analyses including identification of relevant provisions and brief overviews for each law. For a complete list of IWT related projects go to our WILDLIFE TRADE projects page. This policy brief is the last in a three-part series entitled Digital Dangers published by the Global Initiative Against Transnational Organized Crime (GITOC). Drafted by Legal Atlas, this brief examines the challenges presented by internet based crimes, in particular the numerous practical difficulties in determining the legality of observed trade, as well as establishing jurisdiction over the individuals involved in a multi-jurisdictional environment. Working on behalf of the Wildlife Conservation Society to draft the EU Biodiversity Conservation Strategy for Central Asia as a part of the main Asia report “Larger Than Tigers: Inputs for a strategic approach to biodiversity conservation in Asia.” The regional focus is a portion of Central Asia that includes all or parts of the following eight countries: Afghanistan, Iran, Kazakhstan, Kyrgyzstan, Pakistan, Tajikistan, Turkmenistan, and Uzbekistan. Other countries in the region are part of the Larger Than Tigers publication. Working in collaboration with the Zoological Society of London, members of the Legal Atlas team conducted a comprehensive field survey of wildlife trade in Mongolia, resulting in a extensive report, Silent Steppe II: Mongolia's Wildlife Trade Crisis, Ten Years Later. The project is a sequel to the most comprehensive IWT study conducted in Mongolia to date, Silent Steppe. Working in collaboration with the United Nations Environment Program World Conservation Monitoring Centre (UNEP-WCMC) to help draft an analysis of institutional arrangements in Areas Beyond National Jurisdiction (ABNJ) (covering approx. 42% of the planet) as part of a Global Environment Fund (GEF) program. The resulting report is entitled Governance of areas beyond national jurisdiction for biodiversity conservation and sustainable use: Institutional arrangements and cross-sectoral cooperation in the Western Indian Ocean and South East Pacific. On behalf of WWF, Legal Atlas conducted research into the import related laws and measures in eight countries that can be used to prevent or prosecute the ingress of illegally sourced wild flora and fauna, marine species, and timber products. Working with ZSL's Conservation Programmes department, Legal Atlas conducted research into the legal and policy foundations concerning extractives and protected areas, with a particular focus on World Heritage Sites. The final report was in the form of a Policy Brief containing findings and recommendations for presentation at the World Parks Congress in Australia in November 2014. Working under the direction of the Wildlife Conservation Society with funding from the Convention on Migratory Species, Legal Atlas acted as the principal author of a new set of policy guidelines for linear infrastructure development. The geographic focus was limited to 7 Central Asian countries and looked at opportunities to improve policies and practices to avoid and mitigate the impacts of linear infrastructure on migratory species. A copy of the Guidelines can be downloaded from the CMS Secretariat's website. The World Bank sponsored the Ministry of Agriculture, Irrigation, and Livestock in Afghanistan in its efforts to develop a comprehensive legislative and regulatory framework for fertilizers. Legal Atlas was asked to assess and assist with the creation of a full legislative framework for the management of fertilizers, with particular attention to quality control processes. Legal Atlas supported the IUCN's Environmental Law Center to design and conduct a a comprehensive assessment of REDD+ legal frameworks including case studies in five countries. Countries included Cameroon, Ghana, Guatemala, Uganda, and Indonesia. The assessment resulted in a set of guidelines to: (1) increase the scope and competency of institutional services related to REDD+, (2) outline principles for legal reform exercises, (3) provide a basis for appropriate inclusion and cooperation with communities in REDD+, (4) establish a tool for monitoring and evaluating related laws in other countries.